Fold the card in half and draw half a butterfly shape. Cut out and unfold. 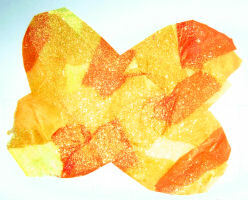 Alternatively print and cut out one of our butterfly templates. Place the card on the table and cover with a sheet of clear food wrap. Paint white glue over the top of the clear food wrap. Tear small pieces of tissue paper and stick to the clear food wrap - make sure that the kids' clothes are well covered up first, because they tend to get very sticky at this point! When the butterfly template underneath is covered, paint on another layer of white glue and add more tissue paper. Paint on a final layer of glue and sprinkle with glitter. Leave to dry overnight. Peal the paper away from the clear food wrap. 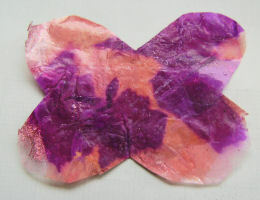 Draw around the butterfly template on to the tissue paper and cut out. Punch a hole in the top of the butterfly if you wish, and use ribbon or thread to suspend in a window. Or make lots of butterflies and hang as a very pretty mobile! This butterfly craft is perfect for younger children but can be enjoyed by all ages: older kids can design their butterfly while younger children will be happy to tear shapes and arrange them haphazardly. You can see examples of both types of butterfly below. Our butterfly shape collage is a pretty way to reinforce shape learning with younger children and of course can be adapted for whatever materials you have on hand.